My friend (we’ll call her Anne) is having a hard time. It’s not a stubbed-my-toe/forgot-to-pay a-bill/burned-dinner kind of hard time. It’s a years’ long grind of suffering and grief. I didn’t know until I was sick the difference between hard and suffering. One night I was lying in bed, struggling to breathe. I was afraid to cry because mucus is my sworn enemy. I was hurting. I was exhausted. I was frustrated. I was scared. It occurred to me in that moment that this is what suffering is. So when my friend said to me, “This is suffering,” I understood what she was trying to say. She was saying that she was in a place where pain was deeper than hope. She had forgotten what it would feel like not to feel the misery and torment. She could find no place beyond that. She felt crushed by the burden. It blocks out the light. There have been a number of wonderful people who have rushed in to help and lift and sustain. But there have also been many who turned away. Today a family member explained to Anne that she ignored the latest grief that was happening for six months because she didn’t know what to say. 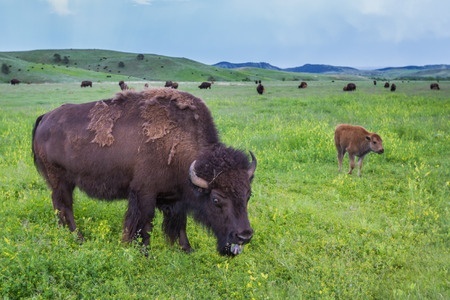 The American buffalo (more correctly, bison) is an interesting animal. It has managed to become a symbol of the American West while sporty beady little eyes and a half-on half-off coat that will never be in style. Buffalo have a hunchback, and an absurdly underdressed back end. They look like a toddler dressing themselves for the first time. It is what is on the inside that counts. On the inside buffalo have little tiny brains and big tempers. They’re kind of the “me” of the animal kingdom. They are silly looking. But they are ginormous, kicky, and mean. We all have our strengths. These big stupid animals do a cool thing. If you try to attack the herd, a few buffalo will charge you. If you manage to avoid being gored or turned into toe jam, you will find that the herd has reconfigured itself. The buffalo form a circle standing shoulder to shoulder and facing out. In the center of that circle are the young and weak. All you have to do to get to them, is try to make it through a buffalo wall. Good luck to you should you decide to try. And do please look up “goring,” just so you know. I am a writer and a reader. There is nearly nothing I believe in more strongly than the power of words. In fact one of my precepts of life is, “Words are a tool of creation.” I believe the words we use, the words we choose, write ourselves and our lives. Words matter. But they do not matter more than love. Dumb and unlovely as the buffalo are, they know when it is time to make a circle. It’s pretty simple, really. I have no words to fix it. But suffering is a place beyond words. Even for me. Suffering is a pit so dark, a grief so big, a hurt so transforming, that only love can make the way. You don’t have to know what to say. This isn’t Harry Potter. You aren’t casting spells that will take away grief and pain. You cannot say words that transform suffering into joy. You are not an alchemist. But you could stand together and look as fierce as we can. We can tuck the weak and sick and broken in behind us and face down the wolves. Sometimes we will fight the wolves. Sometimes we will need shelter ourselves. Our Father in Heaven will walk with the weary. He, not we, will redeem their pain and suffering. We do not need to find the words. We need to find the love and the courage to stand in blustery cold when the winds and wilds and night come. We need to summon up our kickier angels. You don’t need a single word. Your self is all you need. Buffalo can do it. We can too.